RANDALL ROBINSON HAS WRITTEN a searing, unforgiving expose of the forcible abduction, in February, 2004, of the democratically elected president of Haiti, Jean-Bertrand Aristide, and the consequent deepening wretchedness of its citizens. But he does more than that. In just 270 pages of text, he depicts Haiti from the triumph of the slave revolution in 1804 to the installation of Rene Garcia Preval as president in May, 2006, while thousands of the dissident black population shouted their displeasure and could be heard outside the gates of the presidential palace during the inauguration. Thus, the title, 200 years of unbroken agony. One would have thought that the president of the United States, Thomas Jefferson, having won his nation’s freedom through revolution and having penned those glorious words, “We hold these truths to be self-evident, that all men are created equal . . . ” would have welcomed another revolution in the Americas from a despotic foreign colonial ruler. But instead, unsurprisingly, Jefferson, a slave- owner himself, said, “If this combustion can be introduced among us . . . we have to fear it.” His fellow revolutionary, George Washington added, “[It is] lamentable to see such a spirit of revolution among the blacks.” Imagine! From 1791 to 1804 the African slaves of Haiti, under the brilliant generalship of Toussaint L’Overture, himself a former slave, fought and defeated the armies of France, England and Spain. Over 150,000 slaves of about 465,000 fighters died in the war — one third of the African fighters were killed! This was a more costly war and a more auspicious victory than the American rebellion! “How did a force of ill-equipped ex-slaves defeat the best that Europe could muster against it?” Robinson quite rightly asks. “[A] great many had served in African armies prior to their enslavement . . . sixty to seventy percent of the adult slaves listed on . . . inventories in the late 1780s and 1790s were African born . . . ” (John K. Thornton, “African Soldiers in the Haitian Revolution,” Journal of Caribbean History, 25, 1993). It was the only successful slave rebellion in the history of the world, with black slaves defeating three European armies and losing a third of their fighting manhood! The winners of this magnificent achievement lay prostrate despite their victory — penniless, their educated classes fleeing, without an economy and ripe for exploitation or help from the developed nations of the world. The Bush administration knew that when it came to Haiti, which was commonly perceived to be uniformly black and poor, it could do virtually anything that it wished, without political or strategic consequences. In the eyes of the administration, no one who counted would suffer in Haiti, and no one who counted in the United States would care. Black Haitian democrats had no force or friends in America who mattered to the Republican president or to the U.S. Congress. As a matter of fact, Robinson mentions that when he urged a protest in front of the South African embassy, many prominent blacks, including several black Congresspeople, joined him and eagerly went to jail. They saw that they were protesting white oppression of blacks. But when he urged a hunger strike to protest the oppression of blacks in Haiti, no one joined him in what was perceived to be, that “black mess.” An understanding of that common perception of Haiti is necessary to understand the fate of President Jean Bertrand Aristide. ON JANUARY 1, 2004, on the National Palace grounds of Port-au-Prince, Haiti, President Thabo Mbeki of South Africa gave an address in celebration of Haiti’s bicentennial of freedom. The Haitian president, Jean Bertrand Aristide, began to speak and thousands of Haitians began to roar. They surged forward, overcoming the security guards, and came to the foot of the platform. (” They’re going to riot,” said someone). But instead, the thousands gathered clapped and cheered for their president. Robinson, who was on the platform, leaned over to his neighbor and said, “No one can say he does not have the support of the people.” The neighbor said,” Well, eighty to ninety percent [of the people may support him] but they’re not the ones who count.” When Aristide was elected president by popular vote, he promised modestly to bring the poor blacks “from misery to poverty with dignity.” The rich, for the first time, would be required to pay significant taxes for electricity and telephone services. Before he became president, Haitian citizens were described by birth in two separate categories: the status of those reserved for whites, mulattoes, and the city born minority were citizens; the majority of blacks born in the countryside were designated as peasants. Aristide vowed to change that to one category of citizenship. He promised to raise the pittance the workers received to a modest wage. The plant and field owners howled. This was more than the white plant owners and their American overseers could stand. “Washington responded by stoking violence which it then used to label Haiti and its bicentennial celebration unsafe for Americans and foreign visitors” to attend, Robinson reports. “They’re planning a coup, you know,” said Maxine Waters, congresswoman from California. “I’ve been going to receptions [and over- hearing] at various hotels over the past few days.” The United States, through every means, tried to keep the world away from Haiti’s bicentennial celebration. “It warned the world away from a Haitian celebration that it had calculatedly endeavored to ruin.” Guy Phillipe, a Haitian thug and former policeman, had been selected by the CIA for military training in Ecuador. He led a small group of rebels who, despite their size, were heavily armed, uniformed, and trained by the U.S. army in the Dominican Republic, which had “long enjoyed a warm working relationship with the United States.” Phillipe and his band of rebels were marching across Haiti, killing the poorly armed government troops, and vowing to kill the president upon arriving in the capital. Phillipe was supported by Andy Apaid, a Syrian American, who operated several large sweatshops in Haiti. He was not a Haitian citizen, but he was a member of Group 184, a wealthy antidemocratic group “that had been demanding the president’s resignation and exit, as if two decisive and undisputed nationwide presidential elections had not occurred.” Before the president’s election, Haiti was similar to racialist South Africa. In exchange for the trappings of state power, the dictator Duvalier and his successors gave to the white and mulatto upper class carte blanche to suppress and exploit the largely poor and illiterate black labor force in anyway it saw fit. “This was the Faustian bargain that Aristide threatened with his stunning first election victory.” He threatened to empower the poor to take their fate in their own hands and to rule themselves. Neither the Americans nor their white and mulatto satraps could allow this to happen. This was similar to the attempt to organize a coup against Hugo Chavez in Venezuela. American power and control in Latin America and the West Indies was maintained by having compliant local rulers while the wealth and resources flowed to the United States. Aristide did not fit that mold and had to be deposed. Colin Powell, the secretary of state, and Condoleezza Rice, the national security advisor, were among the most respected people in America. More importantly, they were black. If they didn’t care what was happening to Haiti’s democracy, why would an archly conservative white American president, at whose small-minded pleasure they relished to serve, care? After all, the machinations of the two of them together were largely the reason what was happening to Haiti was indeed happening. I was ashamed. Ashamed of my country. Ashamed of official America, crouched cruel and hiding behind the curtain of public ignorance. Ashamed of the Colin Powells and the Condoleezza Rices who, steeled by unmerited prestige, took full advantage of an American civil rights movement they never participated in, to become their own people’s worst enemies. The book concludes with the inauguration of Rene Preval, sitting beside Jeb Bush, governor of Florida. The shouts of disapproval, for the unpunished anti-Aristide members on the rostrum, could be heard by the thousands of black peasants outside the national palace gates — still tenacious, still determined. A few criticisms of the book: Robinson never treats Aristide as anybody other than as a martyred saint. We need to know of any political mistakes Aristide made. We need an explanation of the damning claim of “necklacing” (burning rubber tires around the necks of foes) that was made against Aristide. Perhaps Aristide had nothing to do with this practice, but it does deserve comment because of its notoriety. When and why did Aristide leave the priesthood? Robinson doesn’t tell us. The book itself could be better organized. It consists of pithy, brief chapters, but their dates jump from a date in 1492, to a date in 2003, to a date in 1804, etc. This is somewhat confusing to the reader. Nevertheless, Robinson’s book illustrates, in its most blatant form, the imposition of American imperial power on a small, defenseless nation that was struggling to lift its people out of poverty. It further illustrates that both Democrats and Republicans of the American ruling class have a common interest when their international economic and power interests are threatened. And, perhaps most sad, the skin color of the servants who carry out the orders of their masters is irrelevant. In the larger context, the United States has always considered Latin America its particular colony. Through various stratagems — both economic and military — the United States maintains control over the countries but prefers that its authority be exercised through native puppets to give some pretense of democracy. The Organization of American States, the United Fruit Company, the World Bank, and so forth, are some of the means used to achieve United States control. A wealthy native upper class that enriches itself and is all too willing to carry out the suppression and impoverishment of its lower and working classes is easily found. Thus, the Latin American countries stand by, impotent, as Woodrow Wilson sends the marines to take over the government of the Dominican Republic or the CIA topples the elected government of Guatemala or Reagan invades Grenada, and on and on, with impunity. Consequently, the abduction of President Aristide and the suppression of Haiti’s nascent democracy was particularly swift and ruthless, to serve as a lesson to other countries. But other countries are tentatively showing their independence: Morales in Bolivia, Chavez in Venezuela, Lula in Brazil. We wait with curiosity to see what the future brings. 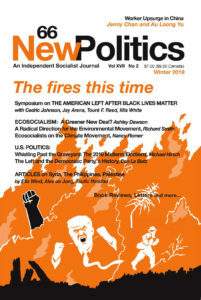 REGINALD WILSON is a member of the editorial board of New Politics. He is Senior Scholar Emeritus of the American Council of Education.